It seems way too early to be thinking about summer camps, yet brochures for this program and that have been arriving in the mail. They've obviously been hard at work preparing for summer -- and for Galileo Learning, the people behind the popular Camp Galileo and Galileo Summer Quest, the process of developing a fun and meaningful program is year-round. 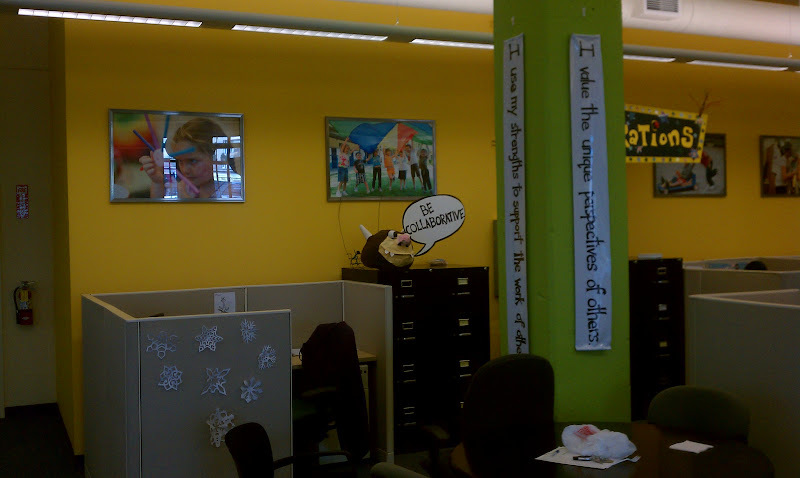 Last week I got to see just how much work Galileo Learning puts into their summer programs when several bloggers and I were invited to their Oakland headquarters for a lunch, talk and tour. Yellow walls? Lime green columns? Monsters on filing cabinets? I'm definitely adding this company to my "Places I Want to Work At" list. 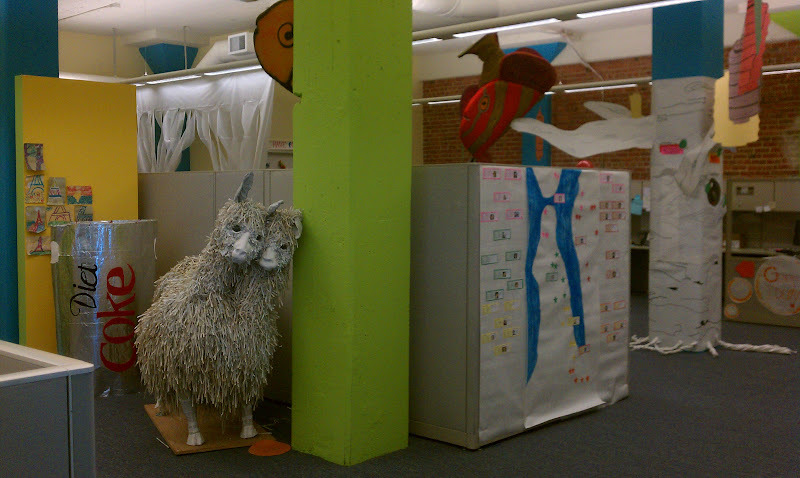 Seriously, how can you stop the creative juices from flowing when you've got a two-headed llama beside the break room? And by the way, that llama's fur is made from strips of newspaper, so you know they didn't take the easy way out and buy it on eBay. Llamas and monsters weren't the only cool things we got to see at Galileo headquarters. We also met Glen Tripp, Galileo's founder and CEO, who gave us an inside look at what drives Galileo and what makes them different (aside from a cool office with two-headed llamas, stuffed monsters and plush Galileo dolls). It would take a whole new blog post to explain it, but Galileo is more than a place where kids do cool projects and have fun -- with every project they complete, campers are learning to be innovators. Camp leaders help kids develop an innovator's mindset, learn a set of knowledge tools and follow an innovator's process (identifying a goal, generating ideas, designing, creating, then going through a cycle of testing, evaluating and redesign). If only all the parents in the Bay Area could have sat in on the presentation, they'd see clearly how Galileo is more than just a summer camp and more than just "Daycare with Legos" (as my friend Robyn from Who's the Boss puts it!). * Parents will be able to purchase hot lunch for their kids from Choicelunch. Again, another godsend, and not just for working parents! You can use Choicelunch's website or mobile app to view lunch menus and order lunch, and your kid even gets a morning snack, so the only thing you need to send them with is a hat and a water bottle. * Galileo Summer Quest, their program for 5th-8th graders, has a new 1-week format (last year it was a 2-week format). Kids now choose just a single area of concentration, or major (last year they had to choose a major and 2 minors), so they can really delve into a single area. If you happen to like the 2-week format, as I did, simply sign your child up for 2 1-week sessions! Many major even have "advanced" sessions so your child's second week can build on what he or she learned in the first week. * There are four new locations for Galileo Summer Quest: Lafayette, Fremont, Sunnyvale and Woodside. * There are four new Camp Galileo Themes: Galileo Olympics (it's an Olympic year, so this is sure to be a popular one! ), Celebrate the Golden Gate (love the local flavor! ), Leonardo's Apprentice and Galileo Rocks -- so kids who have been to Camp Galileo in previous years are sure to find something new and exciting to enjoy. * Galileo Learning has been running San Jose's Tech Museum summer camps for years -- and starting this year, they will be running the summer camps at Chabot Space & Science Center as well. * There are a ton of discounts that parents can enjoy this year -- Multisession discounts (save $20 off the 2nd week of camp, $40 off the 3rd week and $60 off the 4th week and beyond), Extended care discounts (50% off extended care if you enroll for 2 or more weeks), Refer A Friend discount (you and your referral receive $40 off camp), and Eary Bird Discount ($20 off every session if you sign up before March 1). The good news is, they're not mutually exclusive; you can take advantage of all of them! We left Galileo headquarters all excited to sign our kids up for camp and see firsthand just what learning adventures await our kids. Signups for camp have started already, and the earlier you sign up, the better, for two reasons: first the Early-Bird discount, and second, to make sure your child gets a spot in his preferred program, at your preferred date and location. Right now most of the are marked as Open, but as March 1 approaches you'll see more programs marked Almost Full (10 spots or less available) or Full. So hurry and sign up ASAP! Disclosure: This is the first in a series of posts about Camp Galileo and Galileo Summer Quest, for which I am being compensated with a free week of camp for my children. The views and opinions expressed here are my own.